Some anxiety is perfectly normal for kidney transplant patients, but new research suggests that medical staff can help patients feel more at ease when they leave the hospital and that could decrease the chances they’ll be readmitted. High levels of anxiety a week after a kidney transplant patient went home more than doubled the chances he or she would be readmitted within 30 days of release, researchers found. And anxiety was higher for patients who received inconsistent directions related to post-discharge care while in the hospital and who reported less-than-optimal empathy on the part of nurses, doctors and other caregivers, researchers from The Ohio State University Fisher College of Business and Wexner Medical Center report in September’s Journal of Surgical Research. “The more patient-centric the care, the more trust the patient had in the information provided, the lower the anxiety level after discharge,” said Aravind Chandrasekaran, study co-author and an associate professor of operations and associate director of Fisher’s Center for Operational Excellence. Readmissions can happen for true medical reasons – such as a patient taking the wrong medications or not adhering to post-transplant safety measures. They can also arise when the worried well return unnecessarily, said Susan Moffatt-Bruce, study co-author, cardiothoracic surgeon and chief quality and patient safety officer at Ohio State’s Wexner Medical Center. “Sometimes we can make ourselves unwell because we’ve been so anxious,” she said. Standardizing post-transplant care and training caregivers to convey more empathy during their educational interactions could go a long way toward keeping new kidney recipients well and out of the hospital, the study concluded. About 17,000 people receive kidney transplants each year in the United States and more than 100,000 are on the waiting list, according to 2014 data from the Health Resources and Services Administration. More than 30 percent of them are readmitted within 30 days of their release, previous research has found. When patients head home, good self-care – including taking medications properly and avoiding infection risks – is critical for maintaining good health. But the list of instructions for transplant patients is long and it can be confusing, Chandrasekaran said. On top of that, patients sometimes hear conflicting advice from different members of their care team. Prior to beginning the study, he and his collaborators reasoned that anxiety after discharge could be a significant player in the high rate of readmissions. Researchers also shadowed the care team to listen first-hand to the instructions they gave transplant patients after their surgeries. One example of inconsistent advice they witnessed: One nurse recommended “a lot of fluids,” another said to drink two liters a day and another told the patient to consume 100 ounces. “There must have been 16 different ways to tell them to drink a lot of water,” Chandrasekaran said, adding that this wasn’t because the nurses weren’t following protocol. Rather, they were passing along various guidelines they’d been told over the years. The researchers then used information from those shadowing experiences and the initial 20 interviews to develop surveys given to another 77 kidney recipients, 24 of whom were readmitted within 30 days. “We wanted to see what was it that caused them to have anxiety and what could we do to alleviate that,” Moffatt-Bruce said. The researchers assessed the consistency of patient education using a five-item test that measured the ease of getting information and the level of understanding of symptoms and procedures. To evaluate empathy, they used a three-item scale that asked patients about their comfort level when they interacted with caregivers. The researchers worked closely with the entire transplant team at Ohio State’s medical center, including 24 nurses and several physicians. They found a strong association between anxiety levels a week after discharge and readmission within a month. They also found that the odds of getting readmitted increase by 110 percent for a one-unit increase in anxiety levels. They did not find a direct link between consistency and empathy measured in the surveys and readmissions. But they did find that those elements appeared to play a clear role in raising anxiety, which was linked to readmissions. The researchers took into account factors that could skew their findings – including age, ethnicity, preexisting health conditions and the function of the transplanted organ upon discharge. Since conducting this work, the researchers and transplant staff designed interventions to improve pre-discharge care and attempt to reduce preventable readmissions. The discharge nurses, in particular, played a key role in the changes, which have cut the number of individual instructions given to patients from about 80 to 25, Moffatt-Bruce said. “When you go home you’re going to be more confident, you’re going to be safer and you’re going to be less likely to come back to the hospital,” she said. There was a time not long ago when design teams for products ranging from computer hardware to aircraft carriers were housed within the same four walls of a company. Within the last decade or so, firms began moving away from a centralized design approach to innovation in favor of specialized strategic partners — oftentimes scattered in different locations across the globe. But with the shift away from centralized design to what is known as the distributed innovation model, what challenges do companies face in the product-design process? That was the question posed by Dr. Aravind Chandrasekaran, associate professor of operations in the Department of Management Sciences at The Ohio State University Max M. Fisher College of Business, and colleagues Professor Edward G. Anderson Jr., of the University of Texas McCombs School of Business; Professor Alison Davis-Blake, of the University of Michigan’s Ross School of Business; and Geoffrey G. Parker, of Tulane University’s Freeman School of Business. The researchers’ findings appear in the journal Information Systems Research in a new paper titled Managing Distributed Product Development Projects: Integration Strategies for Time Zone and Language Barriers. The shift to distributed project teams began in the software development field, but it quickly spread to other industries, including a wide range of physical product manufacturers. To achieve design efficiencies and cost savings, today’s companies often seek out strategic partners with the expertise they need, which typically means working with partners on the other side of the world from various cultures who speak different languages. The researchers examined some of the challenges inherent among these distributed teams. The main obstacles they discovered were time zone differences, which typically lead to delays in email response times, and language differences, especially with non-native English speakers understanding jargon-heavy engineering concepts. “We wanted to study what can be done to minimize these barriers within the design process,” Chandrasekaran said. The research team studied 20 multinational firms that span a variety of industries including aerospace, IT, medical device, commercial goods and food processing. The researchers analyzed some of the tactics these firms employed to overcome the challenges inherent with distributed innovation. Some common methods firms use include co-locating workers, whereby members from strategic partner teams spend time with teams from the focal company; modularization of product design, which involves producing components in modules and then bringing the respective parts together later for assembly; and IT solutions, such as video conferencing. The researchers’ findings validate what many managers have discovered, which is that these solutions often do little to minimize the challenges of distributed product development. Two tactics stood out to the researchers. First, they found that firms using standardized design-specific IT systems have greater success in their product development projects. For example, firms that use a design structure matrix process to capture the interactions between distributed development teams fared better than those that did not. The second, often more successful strategy was having a designated person or an entity within the organization serve as the single point of contact between two geographically separated teams. Known as a supply chain integrator, this entity serves as a pivot point between the two locations, even if there are multiple teams within each country. This strategy minimized coordination challenges, the researchers found. With funding from the National Science Foundation, the team interviewed supply chain integrators and discovered common traits, including an understanding of cause and effect, an ability to coordinate the work, systems thinking ability, and bilingual or multilingual skills. However, the researchers are quick to acknowledge that there is no silver bullet for overcoming the challenges of distributed projects, noting that firms must anticipate the tradeoffs when using distributed product development. Citing previous research by Professor Kim Clark, former dean of Harvard Business School, Chandrasekaran said his team’s research also found that “heavy weight project managers” have an edge in distributed workforces because they tend to have access to high levels of their organizations’ management and can use that access to resolve issues efficiently. For firms considering the use of supply chain integrators, Chandrasekaran notes some things to consider. Supply chain integrators are typically employed by the product manufacturing companies, rather than being third parties. In addition to systems knowledge, they often have design and procedural knowledge, as well as an understanding of procurement. Most importantly, the researchers found that supply chain integrators need to understand that when they’re working with their counterparts, it’s not just that they’re working on a particular aspect of the project, they have to understand how that project actually affects the bigger picture. What comes to your mind when we say “grand challenge”? People think about big issues such as ending world hunger and curing cancer. These are certainly big problems that takes several thousand people working every minute for the betterment of the society. We all want to be part of these grand challenges, but either have limited capabilities or the time, given our day-to-day schedule. What if we use these grand challenges as learning opportunities? Perhaps this may allow us to make some incremental contributions and also learn at the same time. This is a perfect learning opportunity for our incoming MBOE students to scope down this larger complex problem into manageable problems in distribution, access, population health, nutrition and consumer behaviors. Our incoming class of students will spend time at the Mid-Ohio Food bank understanding and solving this problem over 5 months beginning November 2019. They will first learn to break the complexity down to workable “chunks”, where to make impactful changes, how to measure and sustain these changes over 4 different learning sessions. 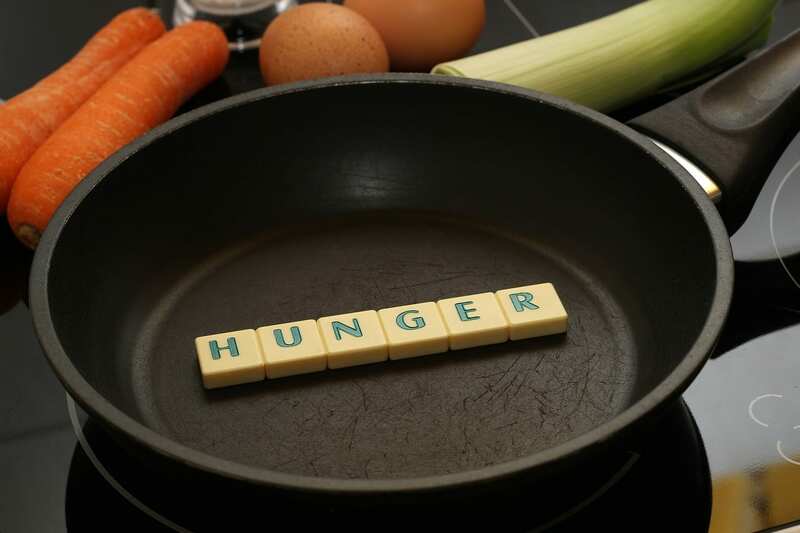 Our students won’t be able to eradicate human hunger in 5 months, but they can certainly make a difference and make substantive improvements in this given time. Our MBOE and Fisher Management Science team are really excited to use this amazing learning opportunity and help our community along the way! Have you ever worked for an organization that is always successful in its mission whose employees are highly committed to its purpose? Anyone reading this article would question the existence of such an organization. 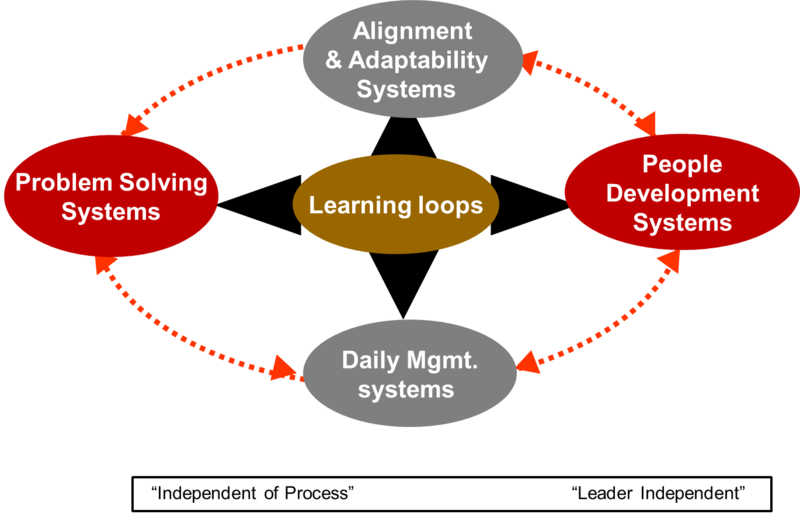 Through our research, teaching and outreach, we found that managers from various industries such as healthcare, information technology, manufacturing and hospitality services are constantly searching for the answer to the question on how to create a perpetual learning organization where everyone continuously learns, improve and remain committed to its purpose every day (similar to the perpetual moving machine shown below). Think about the following example of a healthcare system that personifies such a learning organization where a small problem faced by one unit becomes a great learning opportunity for the entire system. Information about a close-encounter from a regional unit within the hospital system percolates all the way up to the C-suite within 24 hours. It is important to note that action follows immediately after the reporting process. The hospital system tracks caregiver outcomes (e.g. near-miss accident) and prioritizes them along with patient (customer) outcomes. The CEO of the hospital system makes time to travel 60-miles to offer her support to the team in the unit the next week. There are no specialists solving the problem at Apollo. Rather, the team who encountered this problem is tasked to come up with a countermeasure and report on the efficacy of this measure after experimentation. The countermeasure developed in this unit (i.e. process of problem solving and not the solution) is rolled out across all 24 hospitals within 30-days. This process of problem solving results in customized solutions across other units adapted to their needs (i.e. there is no single silver bullet for problems). The entire organization is learning every day and improving from smaller experiments that are happening throughout the system. These lessons are made available to those facing similar problems in a way that same problems do not get solved over and over. Our research with several organizations, including Toyota, Mayo Clinic, Nationwide, Cleveland Clinic, Thedacare Systems, IBM, General Electric and 3M etc. reveals that creating a perpetual learning organization such as the one described in Apollo requires creating four distinct learning systems. They include Alignment & Adaptability Systems, People Development Systems, Problem Solving Systems, and Daily Management Systems. We refer to them collectively as Operational Excellence Systems. See Figure 1 that describes these systems. Alignment & Adaptability Systems – Systems that allow everyone in the organization to understand the value and purpose of the work they do and how it relates to the higher level strategy. This allows them to guide their actions as well develop adaptive skills to change for the future. People Development Systems – Extent to which the firm invest in practices that add skills and capabilities to employees at all levels that allows them to continuously experiment, reflect, learn and innovate and become change agents. Problem Framing & Solving Systems – The approaches taken by everyone when a problem arises in way the problem framing and solving processes are standardized across all levels of the organization and the learning permeate through the entire organization. Daily Management Systems – The practices leaders at all levels use every day to identify potential issues and ensure all activities are on track and create accountability and cadence to the functioning of their units. It is important to note that these systems are leader independent and sustains even after the departure of the architect responsible for creating them. They are also independent of the processes and business functions and has to exist at every level within the organization. Our findings are not only informed through our research but also through our experience developing 300+ change leaders through the Master of Business of Operational Excellence (MBOE) program at the Fisher College of Business. In this program, executives from various industries develop their own operational excellence systems over a year. Through this journey, they document some of their challenges and opportunities when creating these systems back in their organizations. What became evident to us through this learning journey is that even exemplar organizations don’t have all four systems at all levels within their organizations. The answer to creating a perpetual learning system may involve creating “isomorphic” structures of these systems at all areas in your organization. I’ve written a number of times on the skepticism and lack of understanding surrounding operational excellence (Op-ex) deployments in healthcare. Under the op-ex umbrella, there are several change management initiatives such as lean, Six Sigma, Total Quality Management, etc. All of these emphasize the importance of a systemic approach toward the sustainable improvement of key performance metrics. Although there are several books and research on the benefits from these initiatives in healthcare context, skeptics dismiss them as mostly anecdotal and devoid of the rigor necessary for causal inferences (i.e., the presence of op-ex leads to healthcare improvements). In this regard, the skeptics are right. Many existing inferences in this area come from surveys (i.e., asking healthcare leaders about op-ex and correlating results to performance) or are based on secondary data that may not adequately capture op-ex elements. Recent research Peter Ward & I conducted with Dr. Susan Moffatt-Bruce and other collaborators at The Ohio State University Wexner Medical Center leaves little room for skepticism about the impact of op-ex deployment in healthcare. 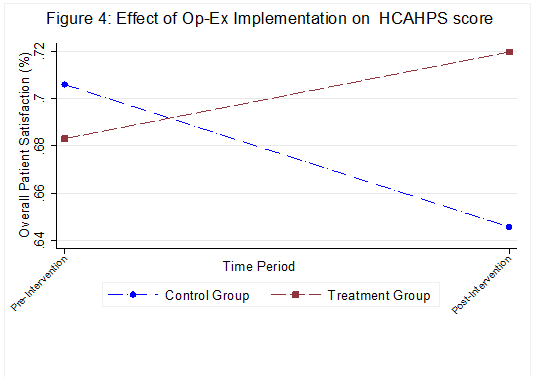 Our quasi-experimental investigation permitted us to compare care delivery performance before and after deployment, using a control group from the same setting to account for any variations in the system beyond our experiment. Results show that op-ex deployment reduced 30-day readmissions, decreased monthly operating costs, improved patient satisfaction and also improved the quality of work among caregivers. In short, it works. 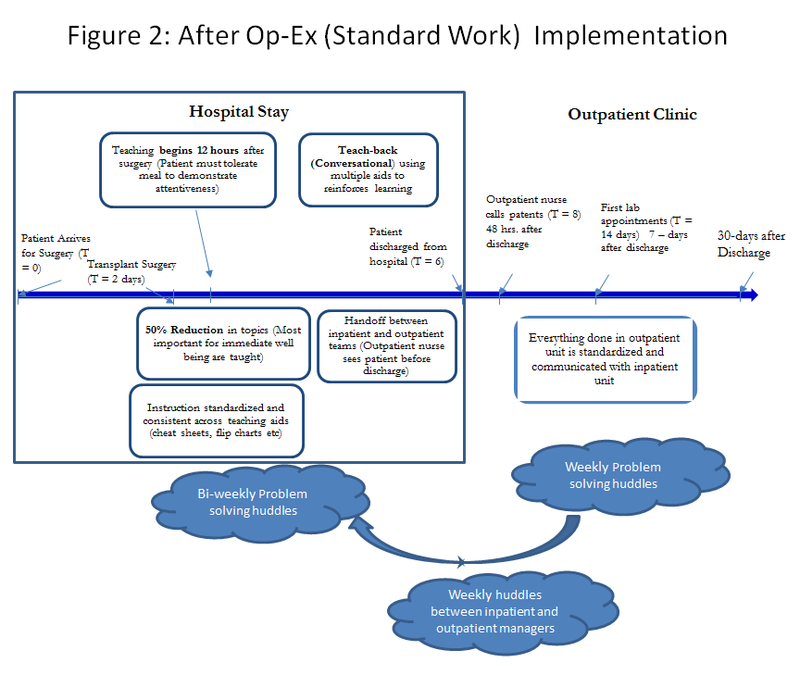 Our experimental intervention was conducted over a period of three years and used op-ex principles to change the way patients were discharged after a kidney transplant. 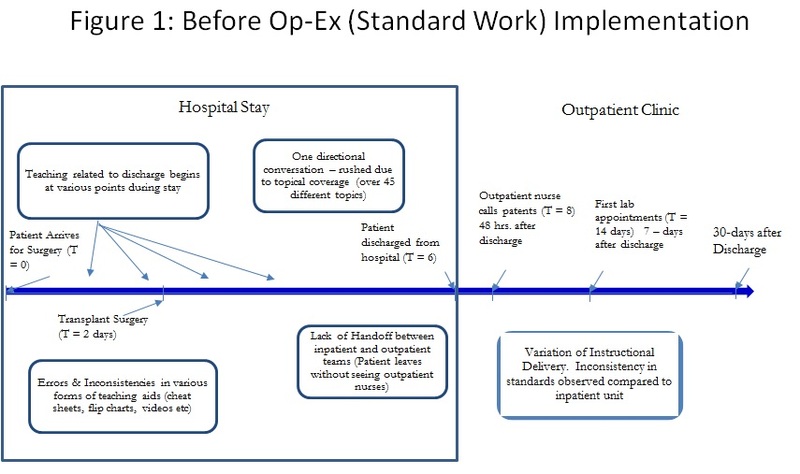 We specifically looked at a fundamental op-ex element: Standard work during patient discharge. This represents the set of activities standardized in terms of content, sequence, timing and outcome but still able to “flex” based on patient characteristics. An important feature of standard work is that it should be designed and developed by people doing the work and continuously monitored for improvement. In our study, more than 40 nurses, physicians, social workers, IT specialists and nurse managers responsible for discharging the patients designed and developed the new standard work over a nine-month period. We focused on the kidney transplant discharge process because these recipients require prolonged periods of care after discharge. In fact, one in three U.S. kidney transplant patients is readmitted within 30 days, resulting in higher hospitalization costs, resource utilization (i.e. longer wait times for other wait-listed recipients), and – more importantly – poor quality of life for the patient post-procedure. When looking closely at the discharge process, we found patients were taking in an overwhelming amount of information in the four days prior to discharge. In this short period, caregivers covered more than 45 topics, including medication, infection prevention, lab compliance, fluid intake, exercise, and dental hygiene, among many others. Some of these instructions – dental hygiene, for one – were not critical to patients’ immediate well-being and could have been given post-discharge. Nurses, we found, also varied their delivery of instructions, adding to confusion and anxiety. Figure 1 represents the current state of discharge process prior to our intervention. As seen from this figure, variability during the discharge process confused the patients and heightened anxiety levels after discharge, triggering readmissions. The new standardized discharge work sought to resolve these inconsistencies. The caregiving team developed specific instructions on the content, sequence, timing, and delivery outcome for each element of discharge, drawing from data on 15 former transplant patients. The team also decided to adopt a two-part instructional approach, with inpatient nurses giving the most essential discharge instructions during the hospital stay (Part I Instructions), while outpatient nurses gave other instructions (Part II Instructions) 48 hours after discharge. This resulted in a formal handoff process between the inpatient and outpatient caregiving teams. After implementing this new process, the team also adopted 10-minute “huddles,” or standing meetings, to continuously monitor and improve communication at inpatient (bi-weekly) and outpatient (weekly) units by focusing on problem solving and best practice-sharing. These huddles have been going on for more than a year, with full participation from the caregiving teams. The entire op-ex implementation, launched in May 2015, took about a year. Figure 2 represents the process after the op-ex implementation. 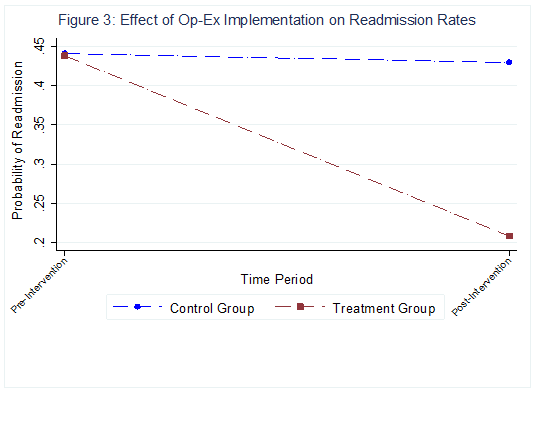 After accounting for all these effects, we used a difference-in-difference (DID) approach to estimate the causal effects of our implementation on readmission outcomes. Our analyses suggest that the likelihood of getting readmitted to the hospital was about 35% lower for the treatment group (kidney transplant process after Op-Ex implementation) compared to the control group and pre-implementation group (See Figure 3). On average, this accounted to a 25% reduction in the overall readmission rates after the intervention for the treatment group, resulting in a conservative savings estimate of $85,000 due to hospitalization expenses for the unit. This doesn’t capture savings from the overall patient well- being after the surgery. We also found a 10% increase in the overall patient experience quality score, measured using the Hospital Consumer Assessment of Healthcare Providers and Systems (HCAHPS) survey. Interestingly, the control group unit experienced an 11% decline in these scores during the same time period (see Figure 4). Improving the scores from this survey has been a key objective for hospital administrators as Medicare/Medicaid reimbursements are now tied to them. Our study shows that Op-Ex transformation indeed can result in improvement across multiple outcomes. The real challenge is how to initiate and sustain this journey. All these results were possible due to the hard work of all the front-line nurses in this unit. They truly are the miracle workers who continue to sustain this journey and innovate as they move along. 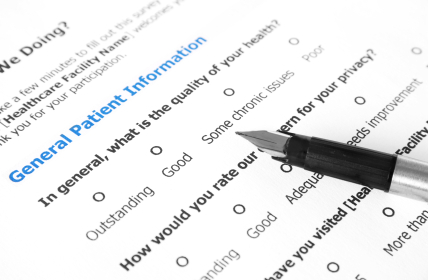 The Hospital Consumer Assessment of Healthcare Providers and Systems (HCAHPS) survey measures the perception of care delivery from a patient point of view. Centers for Medicare and Medicaid (CMS) have historically used this survey as a measure of healthcare delivery effectiveness. Beginning FY 2013, they started measuring hospital’s performance on HCAHPS and made it accountable as a part of value based purchasing program. I have done research with several colleagues from operations and medicine assessing the relationships between HCAHPS survey outcomes and hospital’s clinical performance such as 30-day readmissions (See https://hbr.org/2015/09/what-has-the-biggest-impact-on-hospital-readmission-rates). However, there has always been a skepticism among physicians on the use of this survey instrument. I have listened to so many physicians criticizing this tool and blaming it for subjectivity and other measurement issues (e.g. anonymity, scaling issues etc). While their arguments on the survey instrument has some merits, this is the only standardized tool deployed across US hospitals. My argument has always been that despite these issues, HCAHPS allows hospitals to evaluate their care delivery process (not the people!) and can be used to improve them on a continuous basis. I clearly understand my limitations as a business school professor (a pseudo Doctor) discussing the benefits of patient-centric healthcare delivery among the real doctors with MDs. Now I am not alone in making this argument. A recent study in the JAMA Internal Medicine (http://archinte.jamanetwork.com/article.aspx?articleid=2513630) supports this viewpoint and finds that hospitals with better ratings on HCAHPS are associated with reduced 30-day readmission rates and risk adjusted mortality rates. The study co-authored by Ashish Jha and his colleagues analyzed data from 3076 hospitals and finds that hospitals with higher star ratings are associated (note -not causality!) with lower readmissions and mortality. The real question is that whether this would trigger some changes among physicians on the utility value of HCAHPS now that their fellow physicians arrive at a similar conclusions that are published top medical journal – only time will tell! Hospitals that adopt strategies to reduce errors and meet government requirements face an initial tradeoff between improved patient safety and a decline in the quality of individual patients’ experiences, according to new research. Quality process management, a practice associated with the private sector, is becoming more common in hospitals as they set up operating systems in response to federal and state mandates to reduce medical errors and improve patient safety, the researchers say. It is not surprising to find that the implementation of these techniques led to improved safety outcomes. But finding that these improvements sometimes came at the expense of the quality of the patient experience was unexpected. 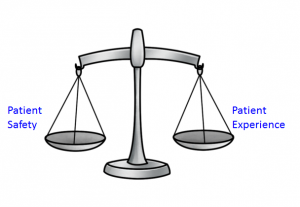 Also referred to as experiential quality, the quality of the patient experience is gauged by how patients perceive their personal interactions with health-care providers. 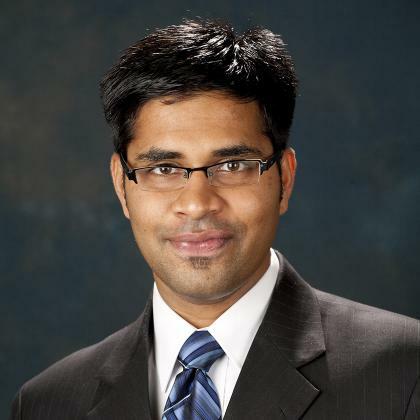 “Patient Safety is about doing things correctly – strict guidelines, standardization and checklists, for example – so when you consider experiential quality is about customizing health-care delivery to an individual patient’s needs, there is a tension there,” said Aravind Chandrasekaran, associate professor of management sciences at Ohio State and lead author of the study. How might this tension play out? Consider a patient safety guideline of giving a beta blocker prescription for patients who have had a heart attack, but offer no suggestions for how to effectively relay that information to a patient. So the hospital gets a good mark for prescribing the drug, but a patient may not understand the instructions and possibly won’t even fill the prescription. Chandrasekaran and colleagues assert that setting up standardized quality management systems is the most effective way for hospitals to meet state and federal mandates geared toward patient safety. Quality process management entails a systematic approach to map, improve and adhere to given sets of guidelines with a goal to minimize an organization’s variation in its processes. Federal and state regulations in health care have become more stringent since 1999, when the Institute of Medicine released a milestone report stating that almost 100,000 people died every year as a result of preventable medical errors in U.S. hospitals. In a move toward standardization, the U.S. Centers for Medicare and Medicaid Services (CMS) in 2003 issued hospital care guidelines related to four health conditions: heart attack, heart failure, pneumonia and surgical care. CMS requires hospitals to report their care practices with these types of cases, and has provided financial incentives to hospitals that are best at adhering to the standards of care outlined in these guidelines. In addition, many states have passed patient-safety legislation calling for reductions in hospital-acquired infections, also beginning in 2003. In the study, the researchers used this legislation as an example of state leadership focused on improving patient safety. These regulations have led many hospitals to adopt quality process management practices to improve their safety outcomes as quickly as possible. 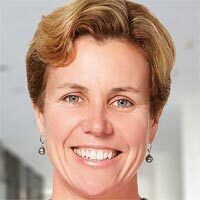 But the researchers also wanted to examine what happened to the patient experience as hospitals focused on new techniques to improve their clinical quality. To determine these relationships, they analyzed four sources of data: a survey of 284 acute care hospitals in 44 states; CMS patient safety scores publicly reported between April 2009 and March 2010; state legislative mandates for reduced hospital-acquired infections passed between 2003 and 2008 in a portion of those 44 surveyed states; and April 2009-March 2010 reports from the Hospital Consumer Assessment of Healthcare Providers and Systems survey as a measure of patient experience quality. Directors of quality or chief nursing officers at 284 hospitals in 44 states were surveyed to determine how extensively respondents were using a data-driven, quality management system to design operations and train staff with the goal of adhering to CMS guidelines. Additional questions examined the leadership style and culture of each hospital. The analysis showed that a focus on quality process management was simultaneously associated with an increase in patient safety as reported by hospitals and a decrease in the quality of the patient experience as reported by patients. State legislative mandates to improve patient safety initially reinforced this tradeoff. However, the earlier these laws were passed, the sooner hospital environments adjusted to operational changes so they could improve the patient experience as well. When analyzing the survey data about hospital leaders’ traits, we found that patient-focused leadership could soften the negative association between quality process management and experiential quality, allowing hospitals to excel in both areas. Hospitals also commonly survey patients after their stays to gauge their satisfaction with their care. These surveys collect information about patients’ overall impression of their care and whether they would return to the hospital or recommend its services to friends and family. This suggests that patients are able to understand and appreciate the standardization in hospitals if they experience better levels of communication during their care. 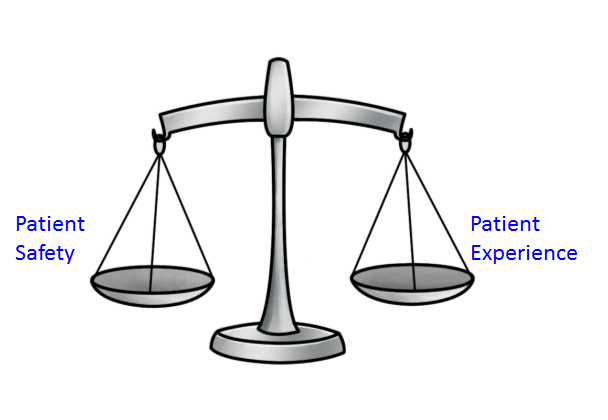 In other words, treating patients well enables them to better perceive when they are getting the ‘correct’ clinical care.